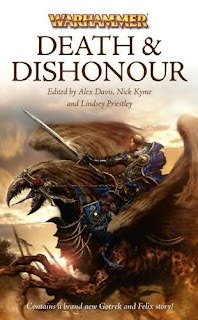 Today is a very good day, as the Death & Dishonour anthology from Black Library is now in stores. In addition to some excellent Warhammer fiction featuring recurring characters such as Gotrek and Felix, it features my first-ever published short story, The Assassin's Dilemma! In the grand scheme of publishing, I am still very much small fry, of course. I am not going to make any waves, no one will be nominating the story for an award, and honestly I will be incredibly lucky to end up as a footnote in any review of the book. But dammit, I'm a published author now and I am going to celebrate. First chance I get I am going to go to Borders, find my book on the shelf, and giggle like a demented clown. Then I will go eat something deliciously ill-advised, maybe with a cocktail on the side, and then I will go out and strut. And I will ignore the looks of confusion and pity all around me, for I am a published author, and they are not. And if they are, then they will know in their hearts that my actions are right, and secretly they will cheer me on. And now to stick a pin in my inflated ego. My writing output since my last post consists of nothing more than brief scene notes that fill up about a page. On the other hand, I did complete revision of my novel synopsis and sent it off to editorial. More on that later I think. Just finished rereading Malekith in order to read Shadow King, both by Gav Thorpe, both recommended for Warhammer fans and people with an interest in evil elves. I also read Game Change (really, who hasn't? ), which I found to be well-written and interesting. The book confirmed some things I already believed, revealed other things I was disappointed (but not terribly surprised) to learn, and paints a good picture of the massive craziness that is a modern-day presidential campaign. Political junkies have already ordered and probably read the book, but I still recommend it to them. We've got reviews on Amazon's UK site. Someone likes us!